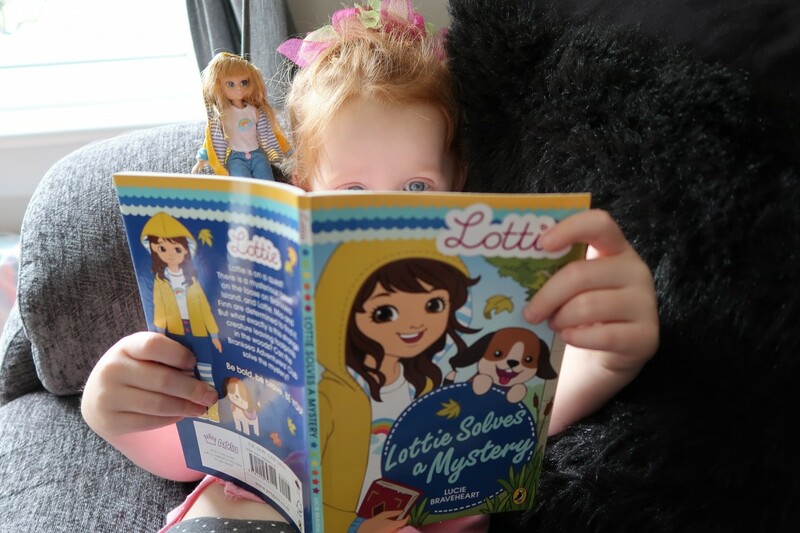 Anyone who knows me or follows me here or on social media will know how much we LOVE LOVE LOVE Lottie Dolls. Then, combine that with another of our loves, books, and voila you have a super exciting product of Lottie’s first chapter book. I know, right? So exciting. 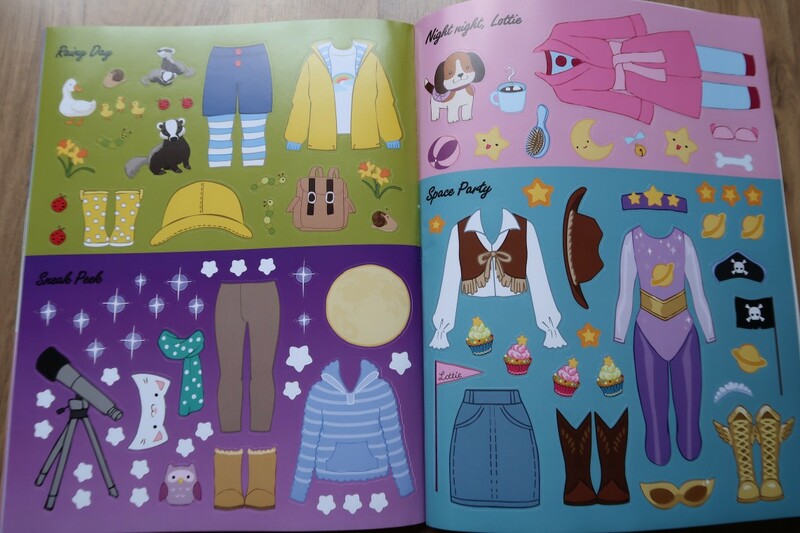 They even have a fantastic Stargazer Lottie Dress-up Sticker book too. How did they know? I always wanted to be a fashion designer and dress-up dolls and sticker books, were a childhood favourite of mine. It is like the lovely people at Arklu and Penguin Random House can read my memories. You can imagine how excited I was to get these. I love the look of Lottie’s first chapter book. It’s simple, inviting and looks fun. Just what you’d want in a book for early readers. Aria isn’t reading herself yet, so we have been reading this together. The chapters are quite short, so it’s perfect for a chapter or two at bedtime. 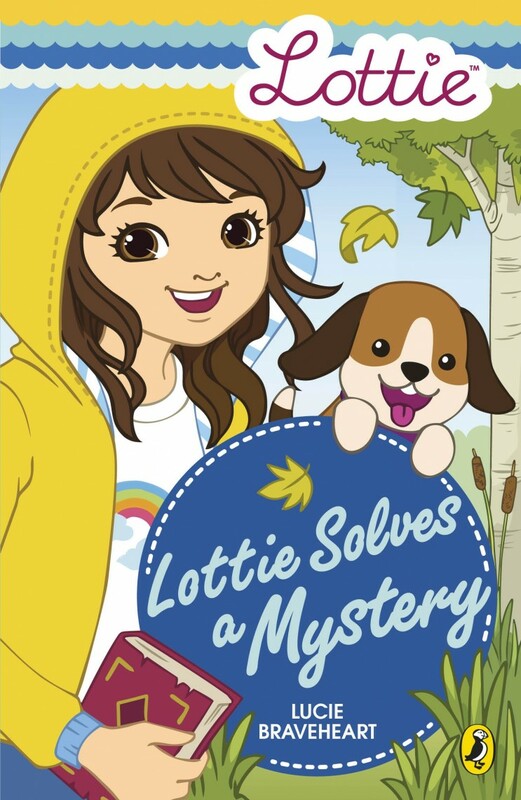 Lottie Solves a Mystery is about Lottie, who is searching for an adventure. Inspired by her great-great aunt’s adventures when she travelled around the world, after she finds her journal. 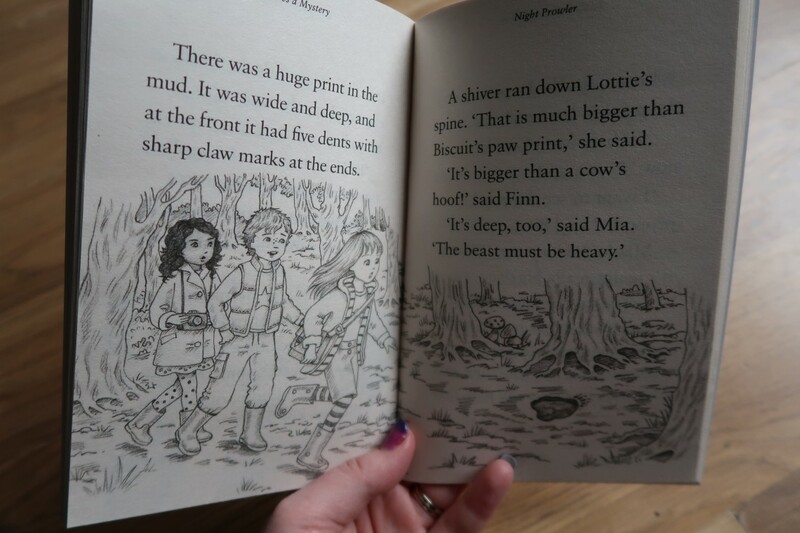 Lottie and her friends Finn and Mia, who are also dolls in the Lottie doll range, go off into the woods in search of a beast. Don’t worry, it’s not too scary, it’s just perfect for sparking little one’s imagination. They put their detective skills into action to try to find out more about the Branksea Beast. Branksea Island is the fictional place where Lottie and her friends live. We also get to meet Finn’s older brother Sami in the book. The story is fun, mystery filled and perfect for inquisitive little minds. The illustrations in the book are adorable. They really bring the story to life. Perfect for little younger ones when you are reading the story and great for newly-independent readers. The large writing and small chapters make this book simple and enjoyable for their young age. It’s not just for girls either, with the introduction of Finn and the adventure boy will love this just as much as girls. My little boy who is 8 has sat and listened to me read this to Aria and makes sure he is there each night. We thoroughly enjoyed reading this book, so much so we’ve started it again. It is everything I’d hope for and the illustrations are perfect. Everything you want for your child to remember about their childhood is in this book. And reiterates Lottie dolls motto “Be Bold, Be Brave, Be You”. What are you waiting for, go take Lottie on an adventure. Check out before for your chance to win your own copy. Which child doesn’t love sticker books? None, right? 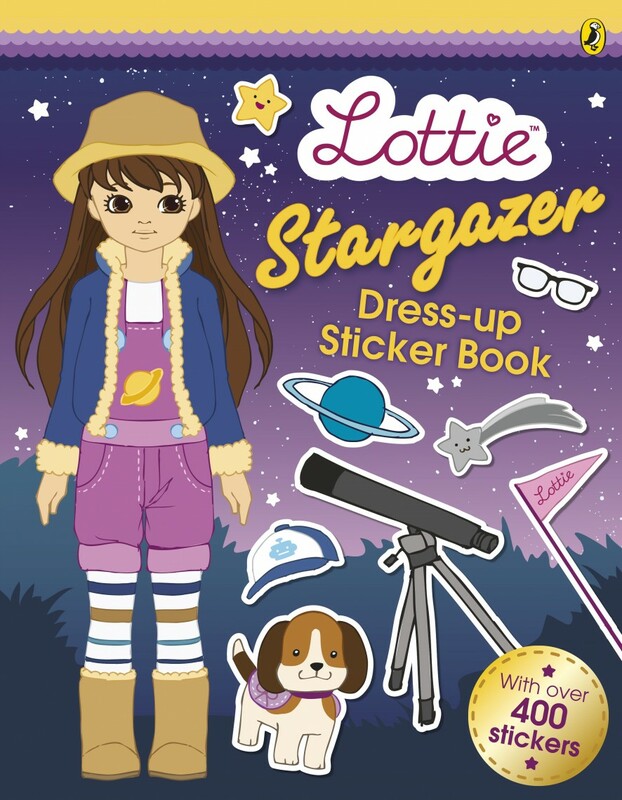 Lottie dolls have also brought out this fab Stargazer Lottie Dress-up Sticker Book. 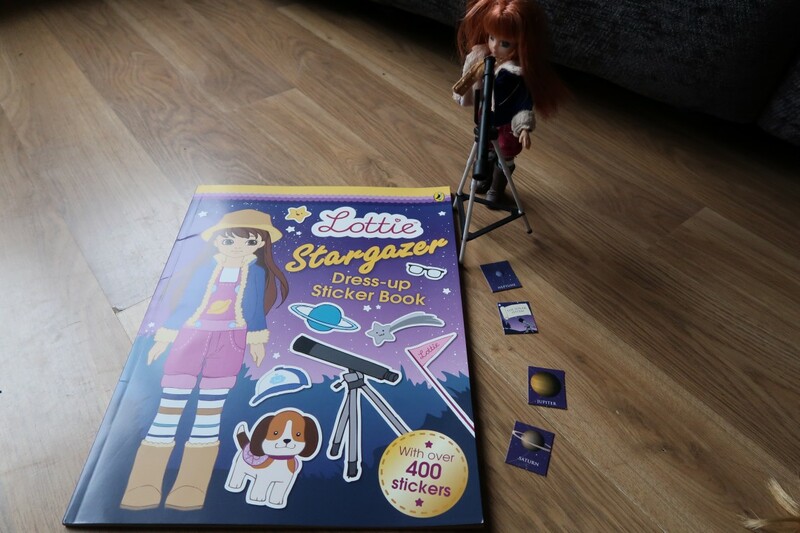 This is not just a sticker book, this also allows you to take and dress-up Lottie for different adventures, but it has astronomy facts on every page. It is really interesting as well as a lot of fun. As you can see what are huge fans and have pretty much every doll in the collection. The sticker book is a marvelous addition. There are 16 pages of stickers with scenes to stick down in this space-themed book. The stickers can be moved about the pages too which is great. I’ve not tested if they have been left on for a while, but we did stick a few and then move them elsewhere and it was fine. The stickers are well made, easier to take off and we’ve not had one that’s ripped yet. Which in my book is pretty amazing in my eyes. The stickers are colourful and there are so many adventures you can dress up your Lottie dolls for. There are also many different Lottie dolls characters which feature. They are simple and easy to lift out and stick, even for the smallest of hands. Look at the colours on that page? They are magnificent. There are a vast number of scenes and with 16 pages of stickers, there is something to suit every taste. As you can see the space facts are really interesting. It makes the sticker book that bit more interactive and educational into the bargain. With a little fun story about each scene. The dolls look like kids and just like the Lottie dolls we know and love. Aria is only 4, but I think she did a great job of sticking the stickers on. She had lots of fun mixing and matching their outfits to how she wanted them to be. She has a style all of her own and brought to life through these fantastic dress-up dolls. Plus the stickers could be peeled off and moved. We absolutely love this sticker book. It is fantastic, looks great, fun and educational too. 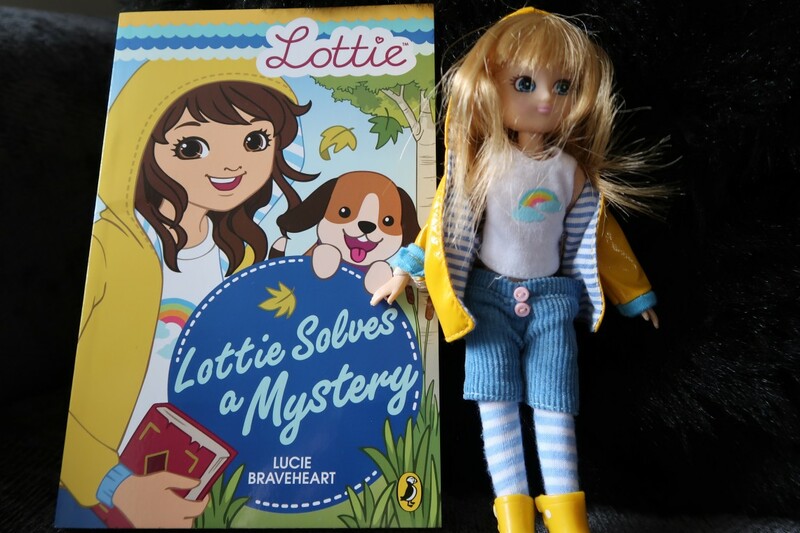 I would highly recommend both books, they are a great price at £6.99 for the Stargazer Dress-up Sticker Book and £4.99 for the Lottie Solves a Mystery Chapter Book. These would make a great gift too. 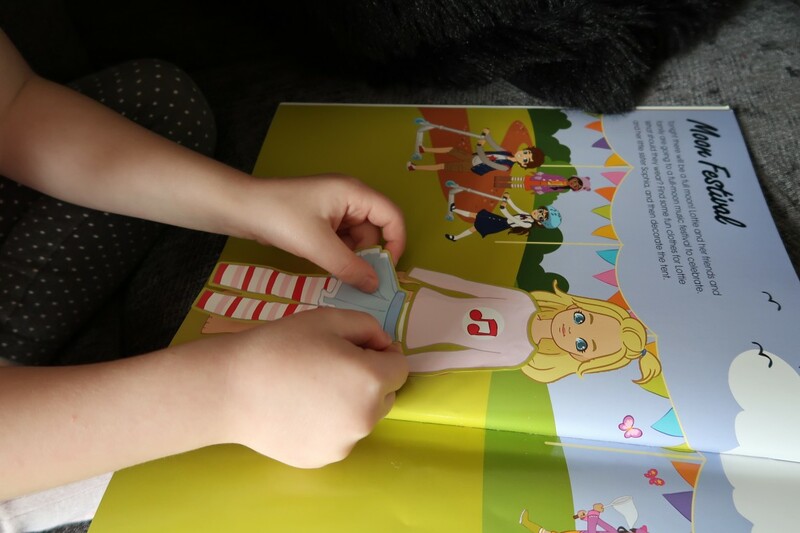 Lottie Solves a Mystery Chapter Book is also Available in WHSmith and Eason, and the Stargazer Dress-up Sticker Book can also be found in Asda. I am lucky enough to have a great competition for my readers to enter to win. I am giving away the following to two lucky readers. Enter below. I reviewed Stargazer Lottie a while back and we loved her. Have a read at what we thought and check out our pictures. I also talk about Lottie being the First Doll into Space. 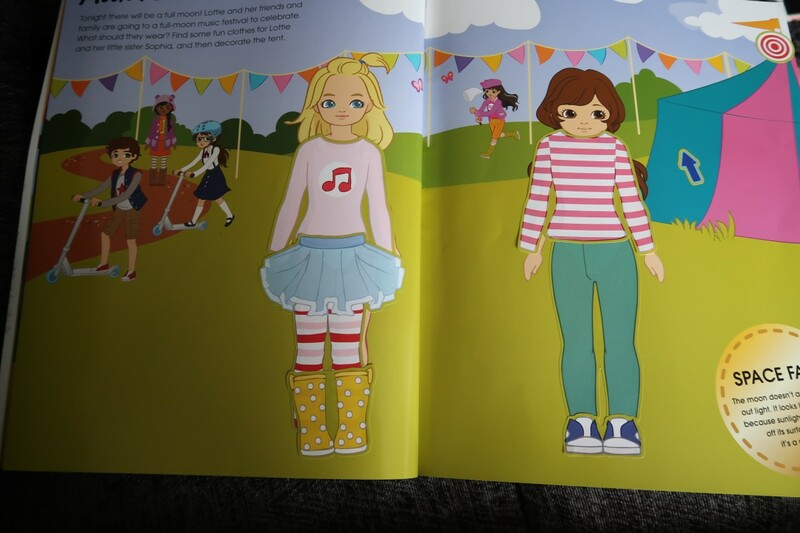 You can also see my reviews on Pony Club Lottie, Muddy Puddles Lottie, Rockabilly Lottie, Super Lottie, Kite Flyer Finn and Lottie Dolls. 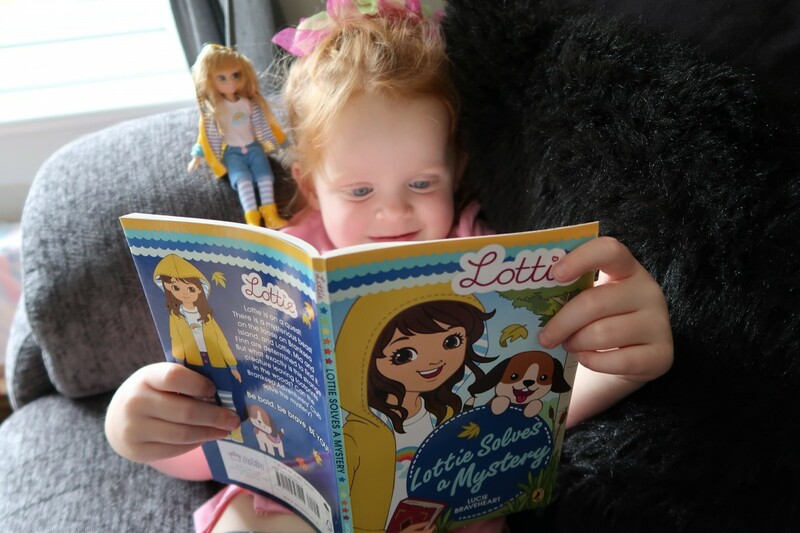 Follow Lottie on twitter @Lottie_dolls and on facebook Lottie Dolls. Disclaimer:- I was sent the sticker book and chapter book for the purpose of this review. We love Lottie dolls and all words and opinions are my own. Check them out. I love Stargazer Lottie as I too love to gaze at the stars! I have a star named after my children that I like to look for! Stargazer Gazer Lottie is on my Christmas Wishlist ..er to give I mean of course! I love the inclusion of woman scientists and really, first doll in space, do you get any more awesome than that! I love the look of School Days Lottie because it reminds me of some of the school uniforms I saw while working in Japan. My daughter loves her Muddy Puddles Lottie. And I’m looking forward to when the Brownies one is released. I’m a Girl Scout and am hoping my daughter becomes a Guide. Fossil Hunter Lottie is my favourite. It’s the sort of thing I loved doing as a child, searching for fossils and the excitement of splitting open a stone and being the first to see the remains embedded in it for millions of years, and my daughters loved it too. I think my grandchildren would as well. Pandora’s box Lottie as we love animals in our house! I’d pick Stargazer for my niece. Fossil Hunter Lottie – would love to go fossil hunting myself! I like the Rockabilly doll, my daughter loves that style!! Rockabilly Lottie doll, she reminds me of my granddaughter, a little bit kooky, and knows her own mind! 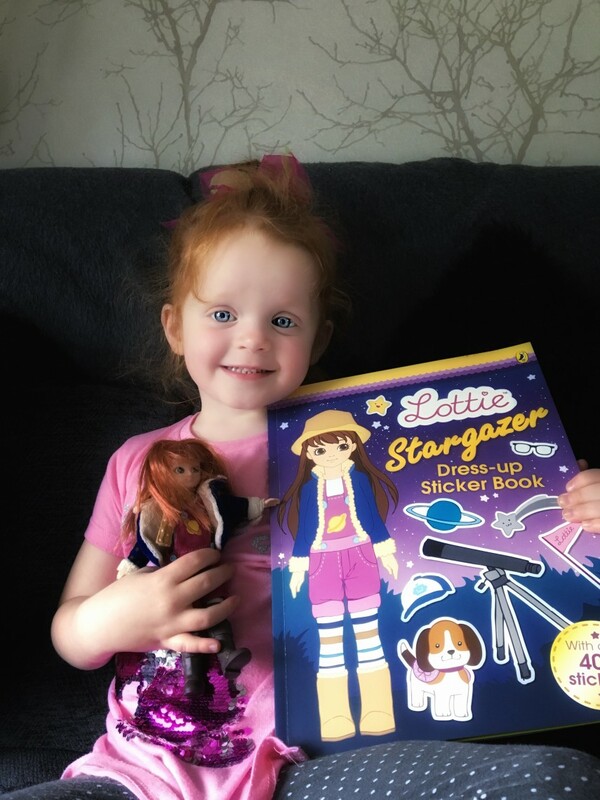 I love Lottie stargazer because my daughter loves anything to do with space and stars! Pony Club Lottie for my Granddaughter as her other Grandmother & great grandmother have horses so she spends a lot of time with them. I think she would like this one more. Forest Friend as we always walk the dog in the forest together. Stargazer Lottie, as we all love anything to do with stars and space. Stargazer is a firm favourite in our house. My little grandaughter summer would love this. My favourite is the Stargazer Lottie Doll. Mostly because I want to instil an interest in science at an early age. loving festival lottie, our nieces loving being outdoors in the summer and this doll would really appeal to them! 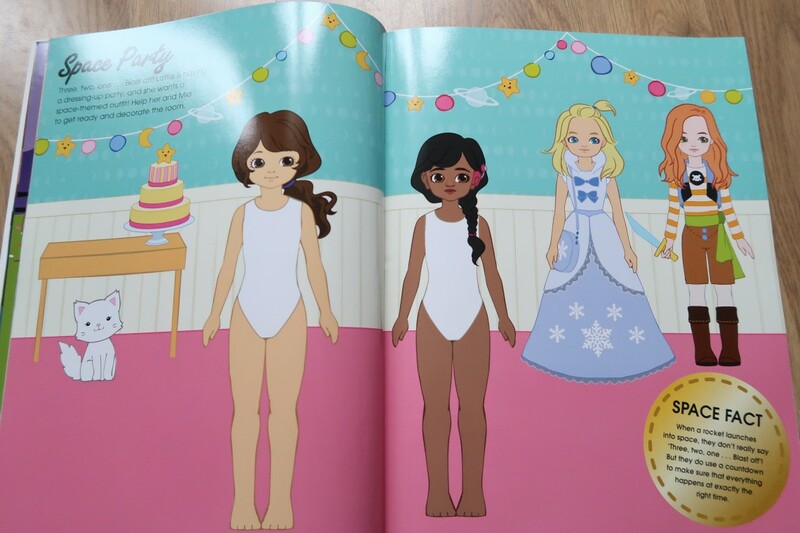 I think it’s great that their are Lottie doll books. It can really help to develop a child’s imagination. Thanks for sharing these with KLTR.